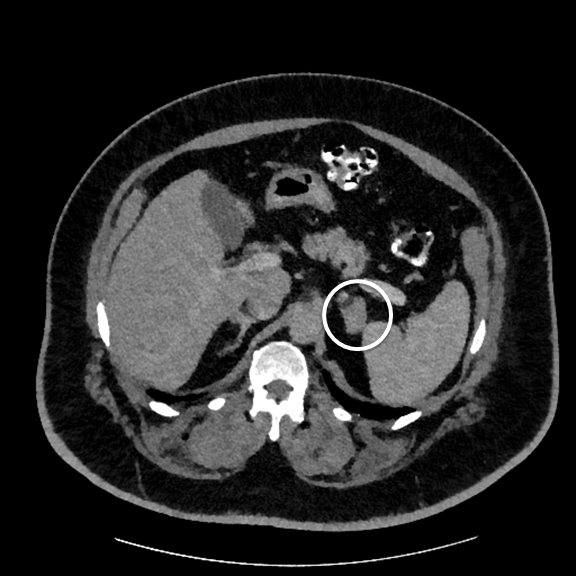 Abdominal CT scan showing 2 adrenal adenomas. 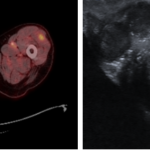 A 62-year-old black man initially presented to discuss bilateral clinically localized stage I, cT1bNxMx, bilateral multifocal renal masses (5.6 × 5.4 cm and 1.3 × 1.2 cm right lower pole renal masses; 4.9 × 4.8 cm left interpolar renal mass) suspicious for synchronous bilateral renal cell carcinomas. He was also noted to have 2 left adrenal masses (2.3 × 1.3 cm and 1.4 × 1.2 cm) that were radiographically consistent with adenomas (<10 Hounsfield units on non contrast CT scan) and less suspicious for metastatic disease. He has a past medical history notable for stage 3 chronic kidney disease, hypertension treated with multiple anti-hypertensive medications, type II diabetes mellitus, and morbid obesity. This clinical quiz was prepared by Marc C. Smaldone, MD, MSHP, FACS, of Fox Chase Cancer Center, Philadelphia. 1. Kutikov A, Crispen PL, Uzzo RG. Pathophysiology, Evaluation, and Medical Management of Adrenal Disorders. In: Campbell-Walsh Urology, 10th Ed; Chapter 57;pp 1678-1729. After extensive counseling, the patient underwent an oral sodium loading test that confirmed primary aldosteronism, and adrenal venous sampling lateralizing over secretion of aldosterone to the left adrenal gland. He then elected to proceed with staged bilateral robotic partial nephrectomies with concurrent left adrenalectomy which revealed bilateral stage I, pT1bN0M0 type II papillary renal cell carcinomas and a left adrenal adenoma.